This session will focus on practical considerations for organisations facing the need to revisit their data centre requirements. John will share experiences from his 25 years in IT service provision, both as an external service provider and as an advisor to organisations seeking to achieve best value from their IT and data centre investments. 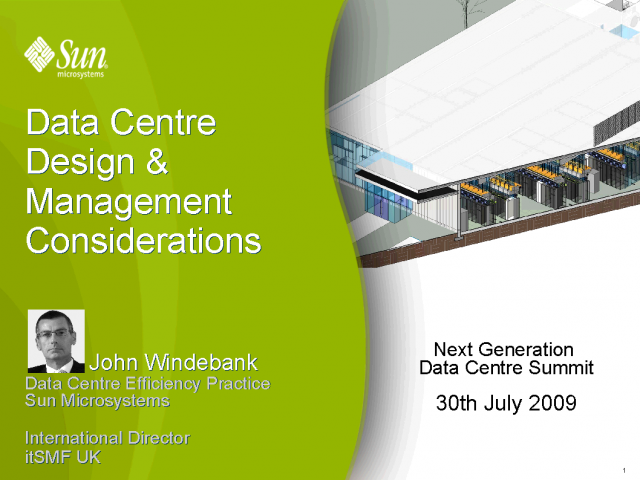 The session will use Sun's own internal data centre transformation programme as a guide to key data centre design influences and what results can be achieved. John will also address the challenges to traditional IT and Data Centre management that Next Generation data centre approaches bring.